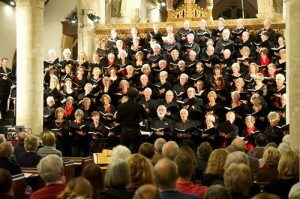 Henley Choral Society is looking for men to join our 100-strong chorus as soon as possible. The men in our tenor and bass sections do a magnificent job – but we need more! Many of our members sang at school or college – if you want to get back into singing, or know someone that does – then this is a great opportunity to join a dynamic and friendly group with a very talented new young Music Director, Benjamin Goodson. There are no auditions to join and we provide lots of support to help singing development. An ability to read music is helpful but all you really need is a love for the music. We aim to sing to the best of our ability, bring quality concerts to the local community with superb professional talent, and encourage the next generation of singers. We rehearse on Mondays, 7.30 – 9.30pm at d:two, Market Place, Henley. Men joining in January 2014 will be in time to sing the Faure Requiem and Poulenc Gloria in the Spring Concert at St Mary’s, Henley, at 7.30 on Saturday 29 March 2 with the Brandenburg Sinfonia and top-quality professional soloists. If you are a bass or tenor who would like to return to singing (or know somebody who fits the bill) then please don’t delay! Call Membership Secretary Wendy Hawkins 01491 576929 or email awaj@waitrose.com or contact Benjamin Goodson direct on bafg@ymail.com. Rehearsals start again on Monday January 6 – new tenors and basses welcome at any time.